Honey Stinger's not so guilty pleasure is organic almond butter and honey sandwiched between two multigrain crackers sprinkled with sea salt then covered in dark chocolate. CHOCOLATE + MULTIGRAIN CRACKERS + ALMOND BUTTER? We think the less you mess with Mother Nature, the better. Thatâ€™s why Honey Stinger uses organic ingredients whenever possible. 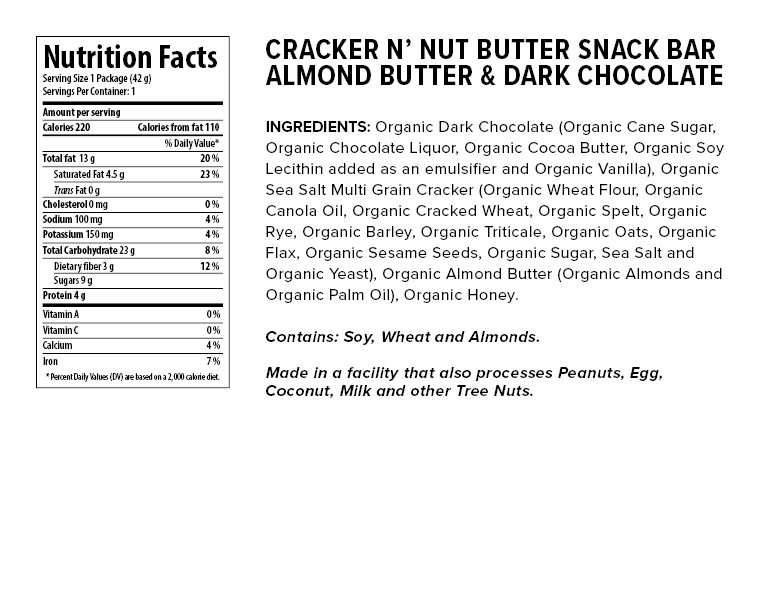 We try to formulate, source and process our products using Non-GMO ingredients. Weâ€™re also committed to establishing trust with our consumers on the origins and authenticity of our honey products through the True Source Honey Pledge. Utilizing an ingredient engineered by nature as opposed to in a laboratory has its benefits, like higher quality and no additional flavoring or coloring. Honey Stinger uses honey, a natural form of energy and antioxidants, as the main carbohydrate source for all products. Research in endurance athletes has proven that a mixture of carbohydrates is better tolerated by the body, prevents fatigue and enhances performance more than a single carbohydrate form. Honey is considered a combination of carbohydrates, containing the natural sugars fructose and glucose that work together to be quickly and easily digested. In addition, honey’s low glycemic properties have been scientifically proven to increase athletic performance by providing a sustained energy boost that allows blood sugar levels to remain constant throughout activity without a high insulin spike and crash. Consume every 45 minutes â€“ 1 hour for energy maintenance. When consumed during activity, honey helps muscles remain nourished longer through a steady release of energy, delaying fatigue. Consume immediately following activity. Honey is an excellent refueling source, entering the bloodstream quickly and restoring depleted glycogen levels to improve recovery time.